This reset procedure for Canon Pixma MP520 is taken from BilBg (Bulgaria) post in the fixyourownprinter forum, The reset procedure for reset counter in the Canon Pixma MP520 using button combinations. Some users in this forum which have tried this method (canon MP520 reset method) say this method work on Canon MP520. 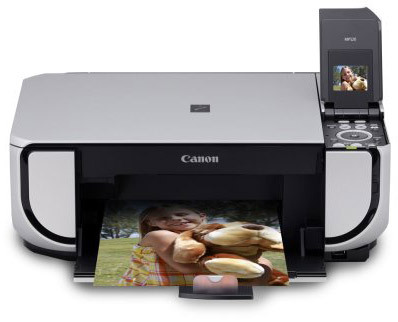 Canon PIXMA MP520 Photo All-in-One inkjet printer with 2 inch TFT display that let user preview, scan, copy and print. This software compatible with Mac OS X, windows XP, 2K and Vista. 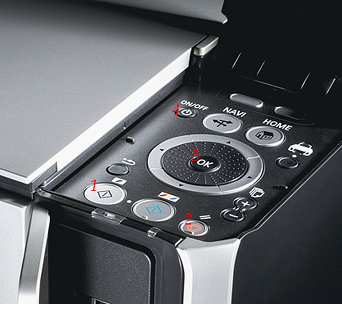 This canon printer using system’s Dual Color Gamut Processing Technology for better copies. Price of Canon PIXMA MP520 printer in the market is $499.99. To reset this canon printer model you follow the reset method in the picture. This procedure was used when I refilled the Black cartridge – try using the ColorCopy button instead of BlackCopy button (number 1) if you refill Color cartridge. Related to "Manual Resetting Method for Canon Pixma MP520"
I’ve tried to fill up the cartridges and it didn’t do the thing as I wished with my canon MP520 compared with the other printer I had before. Can somebody give me a complete overview on how to do the job properly. Thank you all running. Even expected. for MP530 this method seems to work except for step E I needed to hold the 3 remaining buttons until the printer fully started. I turned on and off the printer and I can still print off my old cartridge. Yahoo!! MP510 RESET WASTE INK ABSORBER COUNTER This method doesn’t work for MP510 but this does (Thanks to post on fixyourowncomputer.com) I was able to reset and prevent the printing being disabled once completely full, having used tissue to mop up excess ink from the pad (not a lot!). 7. press POWER to turn off. When you power up again there will be no warning or error message. Hope this helps someone! hy! It worked. Thanks! I also have problem with an other cartridge and i push the colorcopy button, like you said. I have a Canon MP520. When I turn it on, the ink cartridges go back and forth like they normally would. Then it tries the paper feeder and makes a funny noise and stops. The error message is #6000. Might anyone know how to over come this? a. The printer works perfectly. Changed the cartridge and cleaned the head too several times today but on printing nothing comes on paper. Its totally blank. Shows service ref.5200. Any ideas what seems to be the problem ?? b. How do you reset the printer’s memory or erase the printer’s internal memory as I happen to talk to someone who said that after certain time the head stops to print as it has memory limitation and there is a way to erase or reset the same. So i have these 2 problems. Any ideas guys ?? HELP ……….. I have a Canon PIXMA MP 520 that has worked fine up until today…..There is no black printing occuring?! I have tried to swap cartridges, tried scan, tried copy….I get all colour elements of my image but no black. Black and white (ie text pages) come out blank. When I try maintenance procedures they have no effect and system inducates nozzle not clogged, no cleaning required. I have a Canon Pixma MP510 and this worked perfectly. I have been surfing the net looking for a fix for this problem for days and I can tell you the instructions by BillBG is the ONLY method that worked for me. Thank you so much, you saved me the cost of a new printer because I had just about given up on it. This did not work for my mp510. I tried using BrianAuk directions but that didn’t work either. What else can I do? Thank you so much to BrianAuk! His recommendations really worked with my MP550. It saved me a lot of money. tried reset option found on internet, now “serivce mode” comes up on screeen!! On the MP500, you apparently dont get a message telling you IDLE, just a blank whit screen with CANON at the top, but this method works just as well. Thanks BrainAuk. have a canon mp520, up until today worked fine, now getting error message uo51 print head is not installed. install the printhead. tried the 4 button trick but didnt work. any ideas please. I have a MP520. I have been using refilled cartridges for few months, but all of a sudden acts really weird: does not print pictures at all and sometimes does not want to print texts either. MP 520 PRINTER HEAD IS NOT RESETTING.STAYS ON THE RIGHT SIDE AND WILL NOT MOVE. APPEARS TO BE JAMMED. SHOWING ERROR 6A80. WHAT COULD THE CAUSE BE AND HOW CAN ONE SOLVE IT? This basically worked for the MX870 with the U130 error – can’t detect ink level, please replace cartridge – after I refilled the cartridge and replaced it. Held down the + + for 10 seconds, while it was on and it rest. Working like new! solution to error U130 worked! just reset for 5 to 10 secs. love you guys!!!!! How to reset the Canon All-In-One printer, fax, copier to factory default when you’re giving it away or want to start your installation of the printer all over again. All data that you have entered into the printer will be wiped using this procedure so think carefully before proceeding. Your MP530 is now set like it was when it came from the factory. By the way if you just want to erase the Fax memory of documents just unplug the printer for a few minutes after turning it off and then restart it all documents will be erased. I have a MP510 that had no problem until I attempted to change one of the cartridges. I even put the old one back in but was still stuck with incorrect printhead error message. I tried BrianAuk’s solution but still nothing. Maybe this is ready for the ewaste pile. Tried this and a few other convoluted combinations of button pressing, but still absolutely no luck whatsoever. Could just be that I need a new printer. It’s done us many years’ service! WORKS for scanning with low ink warning. Fabulous! Was ready to chuck the damn thing into the yard! je possède ce type d’imprimante, j’ai fais reformater ma tour. L’imprimante refonctionne mais impossible de scanner des documents et des photos ? Faut-il faire ce type de remise à 0 aussi pour remettre le scan en fonction. merci pour votre réponse! amazing!! it worked for me! i’m using a canon M5150. Basically i just pressed the red triangle, OK, and home button, whilst switching the printer on and off a few times. Worked perfectly for the MP520. Thankyou! I have a Canon Pixma MP520 and this has worked perfectly. First try failed, second perfect!!! Thank you so much, you’ve saved me the cost of a new printer as I had just about given up on this one. This works to reset Canon MP520 ink absorber issue. Thanks Brian! My Canon PIXMA MP510 has not been printing in color ever since I got refilled cartridges. I had them refilled AND reset at Costco. I’ve tried all these fixes, reinstalled the updated printer drivers once again, done cleaning, deep cleaning, nozzle check, and print head alignment, all to no avail. I do not want to buy another printer because this one is printing fine with the black which I also had refilled at Costco. This is very mysterious, but the nozzle check pattern is actually printing one very light band each of the CYM, but the dark band of the CYM colors is nonexistent! From the printer controls on the printer (not the software) I did the 2-page alignment printout. This is even more strange: On page 1 the columns were: A = all black; B = was completely blank; C = completely blank; D, I & J= filled with cyan; E & K = magenta. Columns J & K were very light cyan and magenta, respectively, and the little strips were farther apart. Page 2 was completely bold yellow consuming columns L & M. So between the nozzle check which left totally blank strips for the CY&M, and this 2-page printer check, I cannot figure out why the dark colors were coming out on the latter and totally nonexistent on the nozzle check? When I attempt to print a photo, it is only black and yellow, producing a sepia tone. What could be causing this? After installing the drivers that supposedly work with Windows 8.1 a second time, there was a message to make sure that bi-directional support was checked. It is. I am giving up on this unless you have a suggestion for me. Holding down all the buttons, disconnecting the power cable and the printer cable did nothing to correct this problem. Since the printer still works fine, I guess I am stuck with black printouts until it gives up the ghost. Costco said they would refund my money but the printer will not work without all cartridges present. In addition, it would be cheaper to buy a new printer than to buy brand new cartridges just to see if that helps. This is crazy! I recently experienced the dreaded 5BOO Ink Absorber error code on my Canon MP510 Inkjet Printer. After doing a bit of research and exploring a variety of YouTube tutorials, I decided to take my chances and dismantle my 7 year old printer rather than pay the cost to service it. For what I’d pay to have it serviced, I could essentially purchase a newer model, yet for the amount of printing activity it sees these days, I would much rather maintain a printer that I like and have familiarity with. I owe this self-fix-it philosophy to my late father who only called in the experts if there was something he couldn’t tackle himself. I owe a debt of gratitude to Brian Auk for the flawless reset method he shared in his post from February 18, 2011. Dismantling and reassembling my printer was a painstaking process, that at first seemed hopeless by following several other “fixes”; however, by performing the steps suggested by Brian, my printer has a revitalized life ahead of it! Thank you Brian! For an MP600 printer – I had two cartridges showing low ink before the print head error showed. this procedure cleared the error 1. Turn Off (using power button) 2. Press and hold the resume(red), color copy, black copy & power on buttons for 10seconds. 3. Release power button – printer starts to boot up. 4. hold remaining three buttons down until printer is fully booted showing the default ‘copy’ screen on the LCD. No more print head errors!